Bitcoin was trading in the red during Thursday’s trade following reports that Japanese regulators were preparing to crackdown on exchange operating in the country. Bitcoin was trading down 2.49% at $US8,712 a coin, according to Markets Insider data. Follow bitcoin in real time here. Bitcoin was trading lower Thursday amid fears that regulators in Japan might tell one cryptocurrency exchange to cease its operations in the country. The digital currency fell approximately $US200 early Thursday morning around the time Bloomberg News and other publications reported that Japan’s Financial Services Agency (FSA) has been preparing to tell Binance, the largest cryptocurrency exchange in the world, to stop operating in the country without the necessary regulatory green light. “Binance has several staff in Japan and has been expanding without receiving permission,” a person familiar with the matter told Bloomberg. 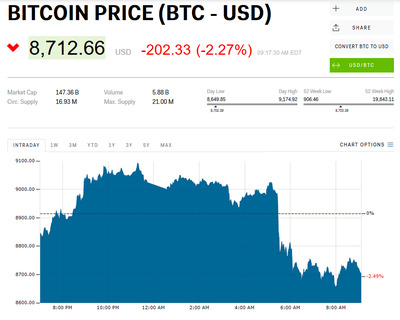 At last check, the price of bitcoin, which frequently sees big price swings, was down 2.49% at $US8,712 a coin. It hit an all-time high near $US20,000 in December. Japan, which has been a haven for cryptocurrency trading, rolled out a system for licensing cryptocurrency exchanges soon after it deemed bitcoin legal tender within the country in April 2017. CoinDesk reported in February that the country’s regulators were looking into about 15 exchanges operating in the country without a licence. Soon after Nikkei, a Japanese publication, reported regulators were examining Binance, the company’s chief executive officer, Changpeng Zhao, lashed out in a tweet. “Nikkei showed irresponsible journalism,” he said. Bianance is the largest cryptocurrency exchange in the world, according to data from CoinMarketCap. It sees $US1.8 billion worth of crypto trade hands on its platform every day.